One of my Jotform email notifications goes to a campaign sponsor. 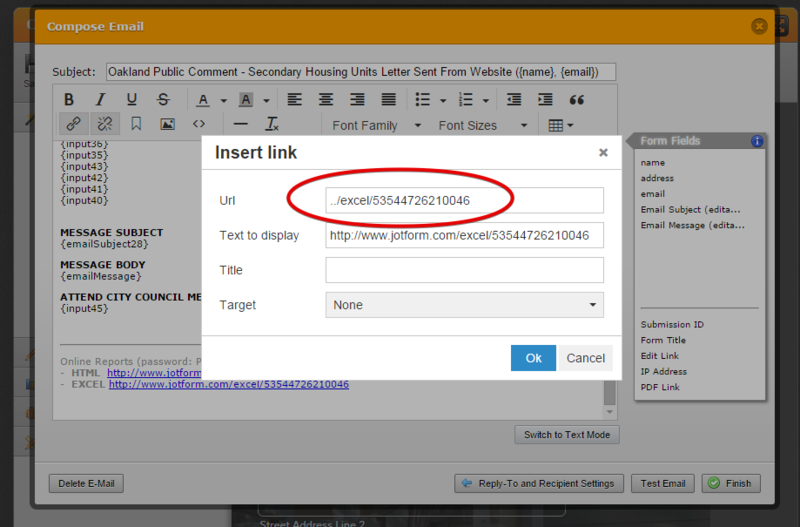 That email includes a link to an Jotform online report as well as Jotform Excel download. which is obviously not a valid URL. I have re-edited this email text to have a valid hyperlink multiple times but it keeps changing. This hasn't happened before on other forms with similar functionality. 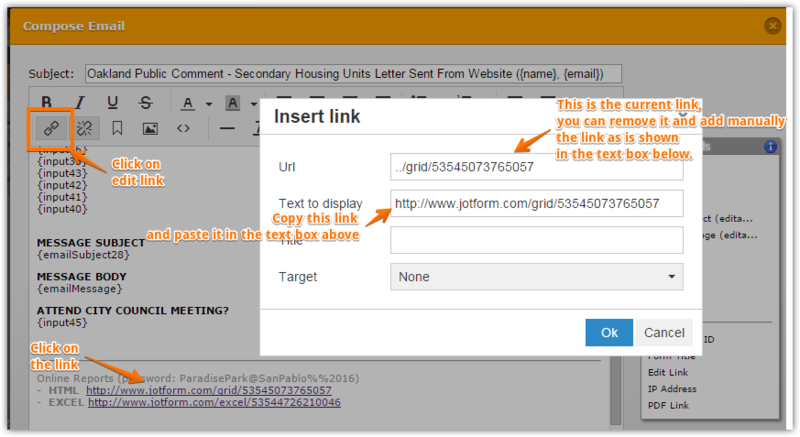 Why is jotform editing my outbound emails and making my links unusable? After doing it, you should be able to receive the correct link. Do let us know if it works, if it does not, we will be glad to assist you. As I stated in my original post, I have edited and re-edited the underlying link numerous times and it still reverts to the odd and non-functional shortened version. I was still able to see the problem on your form http://www.jotformpro.com/form/53515673367967 as well when I checked. I am not sure why it was not saving properly for you. I test it on my end but I could not replicate the problem. So I did the saving for now on that email template of your form and it seems to have sticked. Please check and test again. Do let us know if the issue still persist. 3. I save, exit, and return to the email editor to find the URL has been truncated, rendering it unusable in the outbound mail. BTW I am using MacOS X (latest release) with Chrome (latest release). Unfortunately, I was unable to reproduce your issue, I could see the bad URL , but I was able to paste the correct URL, I closed the form and when opened it again I can see the URL displayed properly. 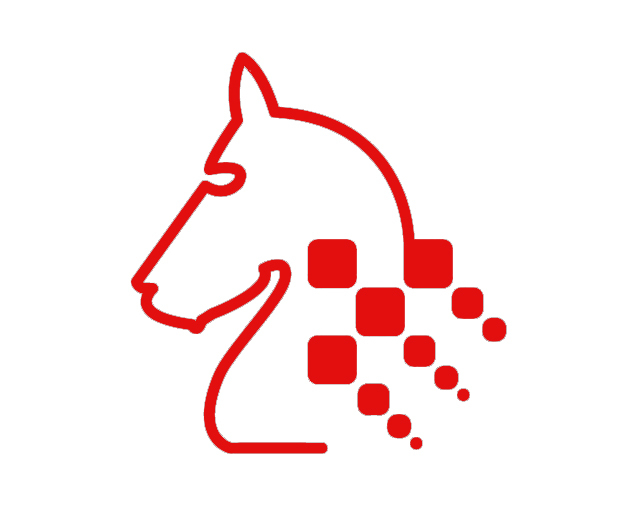 Could your tell us if you are still getting the issue ? Do let us know and provide us, we will be glad to assist you. The solution to this is to use a link shortener like https://bitly.com and then paste the new link into the url field! Thank you Adamraoof for your recommendation. Masalamedia, can you please indicate if the suggestion helps you resolve that issue. As my colleagues indicated, we were not able to replicate the issue on our end. Are you unable to reproduce it using the same environment I reported? Or are you using a Windows PC? To be 100% sure, I fired up a fresh VM of MacOS X 10.10 with nothing but out-of-the-box settings. That VM only has the default installation of Safari and the problem recurrs there to. So this is not machine or browser specific. 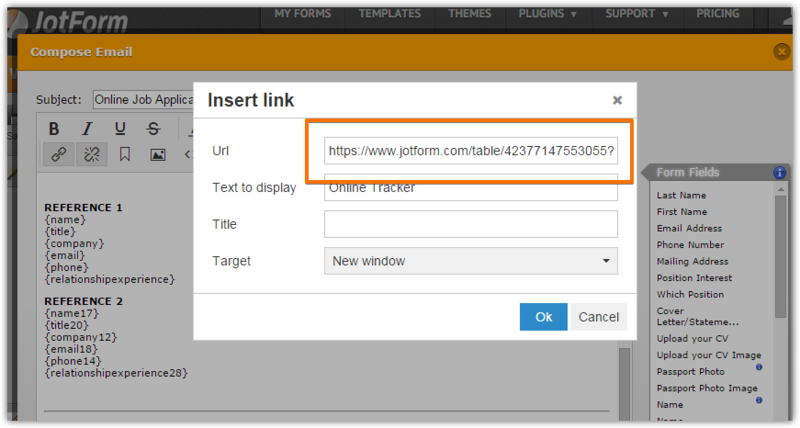 Here is a hint - it only truncates URLS that start with https://www.jotform. Other URLs maintain their integrity. No, I am not going to use another service (Bitly) to cover up for a bug in your system. It should work right, like it has in the past. I have created a ticket for our back end team. As soon as we have any update, we will be informing you. Sorry for not being able to reproduce the issue earlier. There was a problem with how the links were being generated when loaded in the text editor. This is now fixed. Thanks for reporting and we apologize for this inconvenience. I am glad this is fixed - Will I need to go in and manually re-add the URLs that were broken? That's going to be a lot of hours of manual work to fix, if so. It should be those modified email alerts from December 2015 until January 23 which email alerts were edited are those that may be needed to be looked into and have it fixed. For your convenience, I may look into your forms for you and see to it that the URLs in the anchor tags are proper and not truncated. That would actually be terrific if you could check. I started clicking in to many different forms to see which ones might be affected... by looking I actually caused them to truncate, apparently. I would have to go into every email notice on every form to find which ones may have been affected. Perhaps you can do the scan with some back-end tools in a lot less time. It could be EXTREMELY time consuming otherwise. 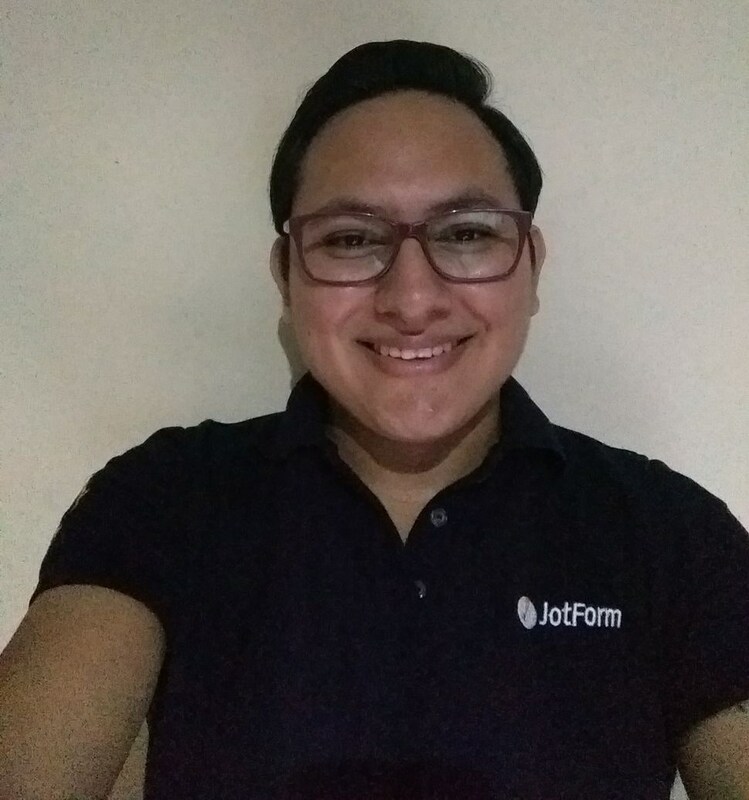 I just checked your forms and I can see the links are being displayed properly now, I checked the link you share us: https://form.jotform.com/60174397080961. And I can see it's working, seems like the URLs were fixed in the process, so your URLs should be working now. 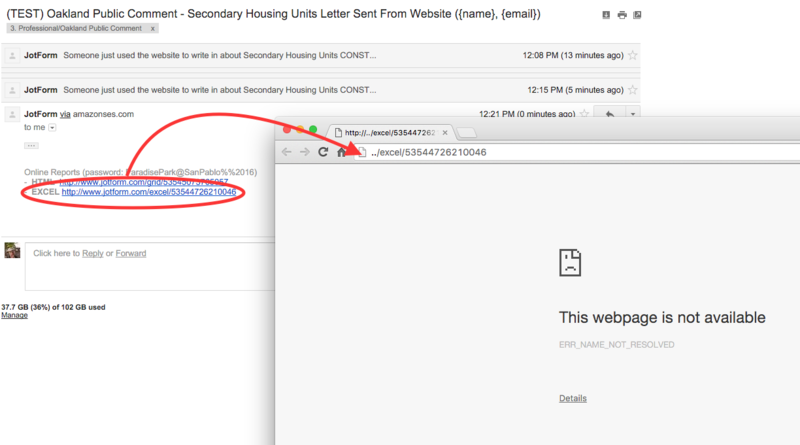 Just one thing I noticed, this form 40625149439963 has the email notification corrupted. You will need to create a new email alert for this. Thank you for spotting that: how am I to figure out what form that number corresponds to? 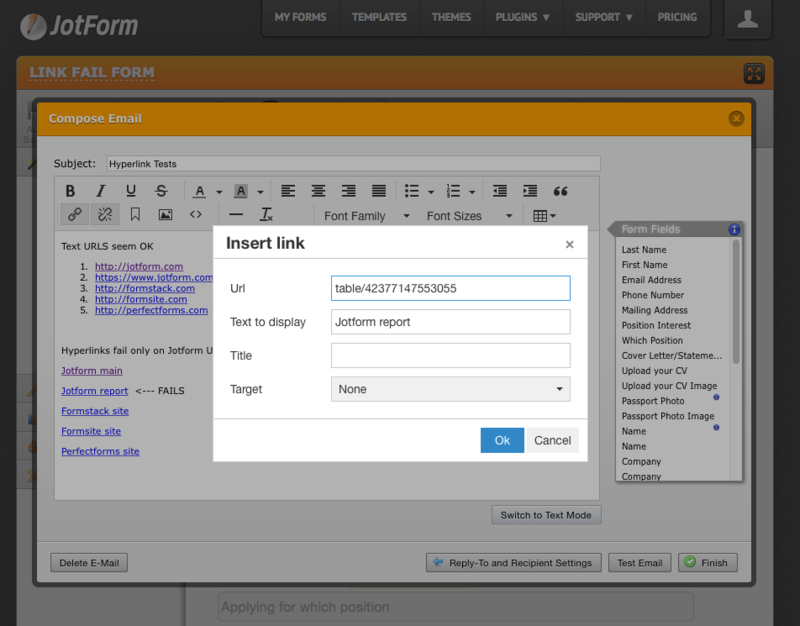 The JF user interface shows forms by name only and I have a lot of forms to inspect. It should yield 1 result matching the form. I m also experiencing this issue. 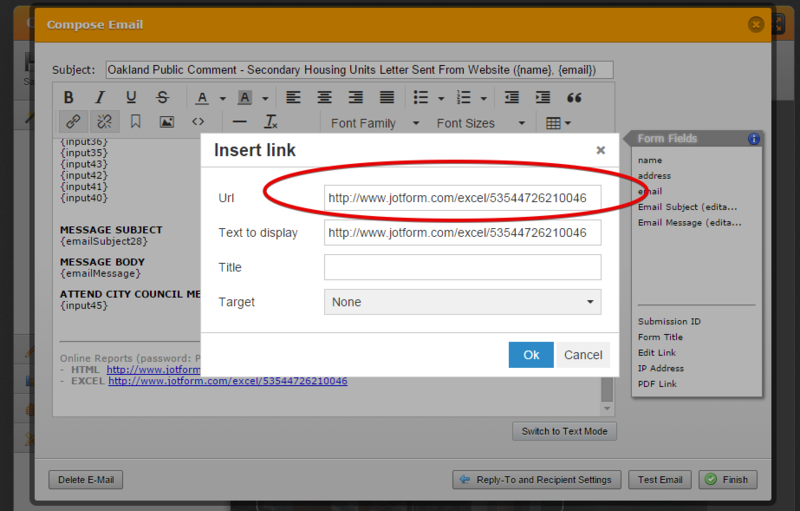 It seems Jotform reduces the link automatically. 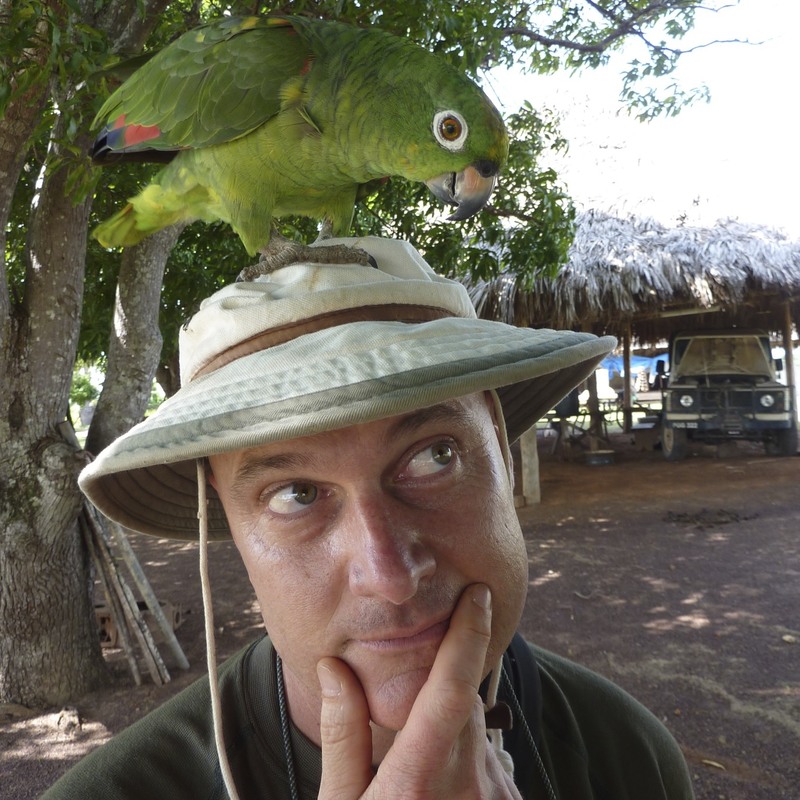 I bypass the problem using Bitly. We will assist you on that link as soon as possible.